There’s something to be learned from every blood-trailing challenge. Follow along with Callie, a bluetick coonhound, as she helps hunters find their deer. I mentioned a couple weeks ago that I enjoy watching the online episodes of The Hunting Public. Even though I’m much older than the co-hosts of the show and have been bowhunting for many more years, I’m not too proud to admit that I can always learn something from other avid deer hunters, especially those who try to arrow mature bucks on public land. Another online series I enjoy is called The Callie Chronicles, which is presented by Primos and Alps OutdoorZ. 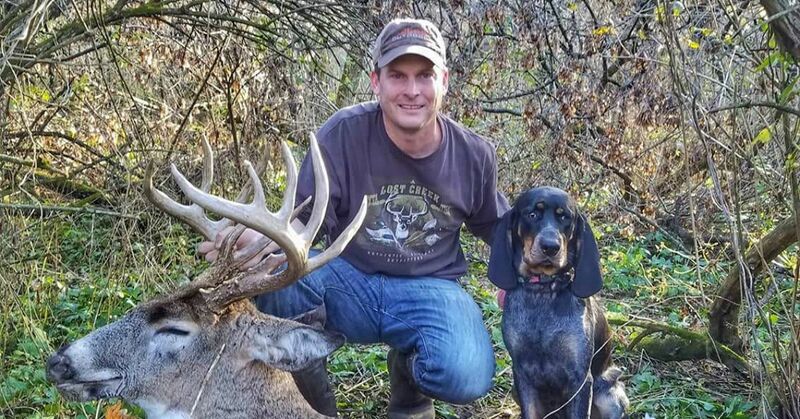 The host is veteran deer and turkey hunter Shane Simpson, and as you’ll see in the intro episode below, Callie the bluetick coonhound is beginning her second autumn of helping hunters find their hit deer. Perhaps I enjoy this series because I, too, have a blood trailing dog. And while my British Lab Togo has helped my friends and I find a few whitetails through the years, I can still learn a few insights from Simpson on how to best utilize a blood-trailing dog in the field. Important note: Callie isn’t following only blood scent to find deer, which is probably why she’s so successful. I look forward to watching more episodes of The Callie Chronicles this fall. FYI to avoid a citation: Regulations for using a dog to recover game animals vary widely across the country. In some areas, dogs don’t have to be on leash or rope, and hunters can carry a bow or gun as they follow the dog. In the states where Simpson is helping hunters, he keeps Callie on a tether and the hunter must leave their bow or gun in the vehicle. Check your local game and fish regs before using a dog to recover hit game.